Eastern Wyoming College announces the Community Roundtable scheduled for Thursday January 10, 2019 has been canceled. President, Dr. Lesley Travers, will be involved with faculty and staff In-Service. The next roundtable will be held February 14, 2019, 12-1:00 pm in CTEC room 218. The Community Roundtables are held on the 2nd Thursday of each month. Eastern Wyoming College is now taking registrations for Financial Peace University. The first class meeting will be held on Wednesday, January 9, from 6-8:00 pm. Financial Peace University is a life-changing program that teaches you how to make the right decisions with your money. You will be empowered with practical skills and confidence to achieve your financial goals and experience true financial peace. Each of the lessons deal with a different topic that will change the way you think about personal finance. Dave Ramsey teaches about how to save money, live on a budget, communicate about money, eliminate debt, find bargains, and experience the joy of giving. If you are struggling with financial problems or planning for retirement, this is a great program for you. The Community Education office at Eastern Wyoming College in Torrington announces the following new yoga class. The Retired Fellers Yoga class will be held on Mondays and Wednesdays, January 8 through March 13, 2019. The class will be held from 9:30-10:30 am in the Fine Arts Dance Room. The cost of the class is $95 for 19 sessions. Student Nurse Association with Santa and instructors at the annual Wreath Auction at the EWC Douglas campus. Front Row: L to r April Klava; and Kenzie Altaffer. Middle Row: Hannah McReynolds; McCall Garner; Sammi Watts; Santa Claus, Stephen Delger, Mrs. Claus, Suzey Delger, Director of Nursing; and Dani Porter. Back Row: Chad Schmitt; Bobbie Burley; Allegra Wagner; Raedel Kellogg; Carolynn Heaton; Brooke Gudahl; and April Clark, Instructor. Eastern Wyoming College Douglas Campus Student Nurse Association held a Christmas wreath auction on December 14 at the campus in Douglas, WY. Students auctioned off a total of 39 different Christmas decorations that included wreaths, signs, and jingle bells. There was a 50/50 raffle and pictures with Santa for a small fee. The total amount raised was $2,750. The money raised will help offset each members National Council Licensure Examination (NCLEX-RN) as well as their room and board (classes are not local) for the two day class at the end of the program. The average cost for the review course is approximately $350-500 per student. Community donations included: Walmart with a $45 gift card, Hardware Hank and many family members of the students donated wreaths and supplies. “A big thank you to all who participated and donated for this auction”, said Nursing Instructor, April Clark. AkSarBen in Omaha, NE: left to right: Ryan Merrill, Hot Springs, SD; Tandy Pickinpaugh, Torrington, WY; James McMurtrey, Evanston, WY; Myca Cantrell, Burns, WY; Kylie Donovan, Haxton, CO; Dylan Shaw, Decker, MT; Alexia Velasco, Paulden, AZ; Joseph Pieper, Mitchell, NE; Baxter Boldon, Buffalo Gap, SD; Rocky Darby, Paulden, AZ; Todd Murphy, Chino Valley, AZ; Lukas Simmons, Evanston, WY; and Kolby Humphrey, Burns, WY. The EWC Livestock Judging Team began their season regionally at AkSarBen in Grand Island, NE; The MidAmerican in Hutchinson, KS; and finally the Tulsa State Fair in Tulsa, OK. Students then traveled to the Western Junior Livestock Show in Rapid City, SD. Their final prep was at the Ram Classic in Ft. Collins, CO before they attended their first national contest of the semester at the American Royal in Kansas City, MO. The freshman team of Kylie Donovan, Haxton, CO; Todd Murphy, Chino Valley, AZ; Dylan Shaw, Decker, MT; and Alexia Velasco, Paulden, AZ finished 8th in sheep and goats, 8th in swine and 8th overall at AkSarBen, while Shaw and Baxter Boldon, Buffalo Gap, SD both placed in the top 25% of the contestants in the swine division. Boldon also placed 9th in beef and 13th overall at the Ram Classic. The judging team ended their fall season at the North American International Livestock Judging Contest in Louisville, KY. Team members included Myca Cantrell, sophomore, Burns, WY; Baxter Boldon and Joseph Pieper, sophomore, Mitchell, NE. “All three students talked at least one set of reasons in the high forties, I was excited to see a significant increase in reason scores,” said assistant coach Zane Mackey. Prior to the contest students had the opportunity to work out at some of the premiere livestock operations in the Midwest including Prairie Rose Cattle Company; Jack Rodibaugh and Sons; Miller Show Goats; Poe Hampshires; Harker Simmentals, and Forsee Southdowns. They also worked out at the University of Illinois and Purdue University. George Elliott with EWC Coach Zach Smith as he signs his commitment to Southeastern Oklahoma State University. Eastern Wyoming College sophomore George Elliott, Salisbury, England, has signed to continue his golf career at Southeastern Oklahoma State University in Durant, OK.
Gonzalo Arcelay with EWC Coach Zach Smith as he signs his commitment to Wingate University. Eastern Wyoming College sophomore Gonzalo Arcelay, Munguia, Spain, has signed to continue his golf career at Wingate University in Wingate, NC. 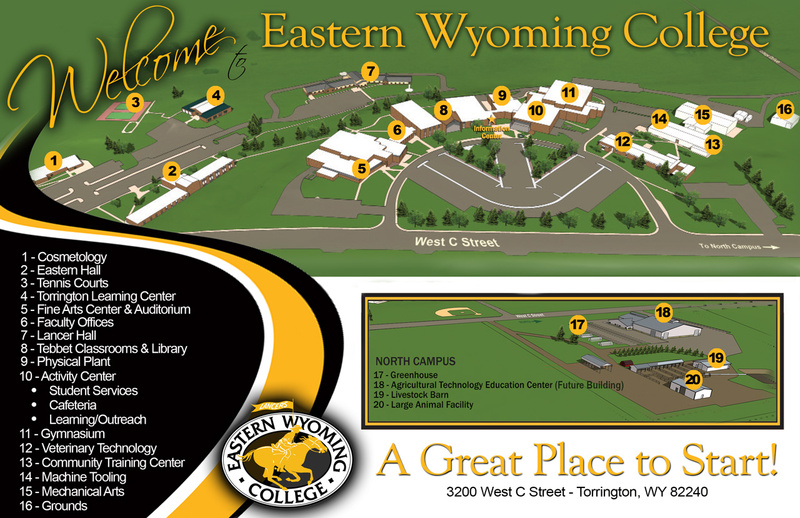 Eastern Wyoming College Adult Education (AE) program was recently recognized by the Wyoming Community College Commission for its number one ranking in terms of preparing students for post-secondary education. Program statistics indicate that students who tested from the AE program at EWC are scoring the highest in the state. This ranking indicates that 53.5% of all EWC Adult Education students who take their High School Equivalency tests are passing at a “Ready for College” level. This includes EWC’s Douglas Campus and Outreach Learning Centers. “Our students work very hard with instructors to get their skills at these high levels. It is our responsibility to help students achieve the highest scores possible so that they are well prepared to meet the rigors of both academic life as well as being ready for employment,” said Diane McQueen, Director of Adult Education. Eastern Wyoming College is excited to announce an expansion of the top-notch nursing program currently held at the Douglas Campus. The expansion will include an evening cohort at the Douglas Campus and an evening cohort at the main campus in Torrington. Each expanded cohort will be able to admit 8 qualified students. The clinical for the new cohorts will include some afternoon clinical rotations as well as some early morning surgical rotations. Most classroom and clinical requirements however will be scheduled between 6 pm and 12 am. Students should also expect to travel throughout the region for clinical experiences. Submit official high school and/or official college transcripts to the EWC Admissions Office. Please verify that the EWC Admissions Office has received your official transcripts by the deadline(307.532.8207). Complete the EWC Nursing Application online. The EWC Nursing Application will be open for students to apply beginning January 3, 2019 and will close at 11:59 pm on March 1, 2019. Applicants must have an overall GPA of 2.5 and a“C” or better for all prerequisite courses. See the Nursing Student Handbook for further information https://ewc.wy.edu/documents/2018/10/ewc-nursing-student-handbook-2018-2019.pdf/. Prerequisite courses include: TEAS (entrance exam), ENGL1010, BIOL 1010, HMDV 1000, MATH 1400, and ZOO 2015. These courses must be completed by May 2019. Midterm grades will be used to calculate GPA for provisional acceptance into the program. All applicants must take the TEAS test (Nursing Entrance Exam) that will be offered at the Douglas Campus and the Torrington Campus at the following dates and times. A minimum score of 58.7% must be achieved to be considered. Call the Douglas Campus at 307.624.7000 or the Torrington Campus at307.532.8288 to schedule an appointment. Appointments will be required for each of these session, no walk-ins will be accepted. Complete program and application information, when available,may be found on the EWC website at https://ewc.wy.edu/academic-services/majors/nursing/.Any questions should be directed to Ms. Suzey Delger, Nursing Director,307.532.2999 in Torrington, or 307.624.7020 in Douglas, or by email at suzey.delger@ewc.wy.edu. As a late addition to the program, Eastern Wyoming College has announced that the sessions from the Wyoming Agriculture Diversification Summit, held on the EWC campus, will be available by webcast. The link may be found at livestream.com/easternwyomingcollege. It will also run simultaneously on the Eastern Wyoming College Facebook page through a live video stream.